Have you ever asked yourself whether you should pick a normal dynamic cardioid microphone like the SM57 or even get in touch with a DI Box to capture the sound of your guitar amp? In the studio you can spend a lot of time finding the best mic position, but in a live situation you normally have to do everything as quickly as possible. The advantage which arises in using a DI Box is not only in saving time, but also in getting a pretty good and consistent sound in every conceivable situation. Make sure you are using a dedicated guitar DI Box including filters to emulate speaker response. They are available in both active and passive versions and mostly are capable to convert line and speaker signals sourced from guitar amps into balanced, frequency-compensated, microphone-level signals with tonal characteristics of a guitar cabinet. In the most ways the use of these tiny little helpers is easier than you would imagine. The only thing you have to do besides choosing your preferred “speaker” settings is to connect the DI Box between the amplifier output and the speaker and using the balanced output to feed the PA mixer. There are a few guitar amps on the market which are equipped with an integrated DI Box and are capable to turn the signal into a very authentic sound. Note: The RED BOX 5 emulates the speaker, not the microphone. In other words, signals provided by the RED BOX 5 sound like those of an actual cab rather than that of a microphone picking up the sound of a cab. The benefits are considerable: You get a fatter, punchier and more direct signal with far greater presence, bandwidth and dynamic range than signals captured with a microphone. With the RED BOX 5, you can take the PA and playback device out of the sonic equation and deliver the sound of a guitar cabinet straight to audiences and listeners. Best of all, there’s no latency, spillover or crosstalk from other signal sources such as drums, frequency cancellations caused by neighboring microphones or any danger of feedback. This signal is the best you can get for processing with compressors, equalizers, reverb effects and microphone simulations on stage and in the studio. Tip: Experimentation is very much encouraged: Make the most of both worlds by mixing the signals from the RED BOX 5 and a microphone. The RED BOX 5 lends every microphone signal more girth and presence without detracting from its inherent characteristics. In this video Thomas Blug gives you a good impression how the Red Box sounds like. He uses a TubeMeister 18 which is equipped with an integrated DI Box to do a pretty nice A/B comparison switching between the cabinets sound and the Red Box. First published: May 14 2014. Most recent update: October 16 2015. Without the possibility to record with a nice cabinet and good microphone, I am trying to use the Red Box and the line out from my Grandmeister DL 40 to insert sounds into Cubase 10 DAW, using a Steinberg UR242 interface. I have a headphone (monitoring) connected to UR242 and two Yamaha amplified cabinets as output. I plugged an XLR to the DI output of the GD40 (in mode: Modern, Large, Line, On) then plugged the other XLR end into the Line 1 socket of the UR242, disengaged the Hi-Z amp from this input, then set the gain so that the red LED does not light up and have a correct sound in the monitoring headphones connected to the UR242. On my GD40 I use Clean channel with gain at 12H, volume limitation at 1W, a little reverb. And with this setting, my recorded sound is rather saturated while it comes out clear of the cabinet connected to the GD40 ? There are for sure parameters to adapt cubase and UR242 to the GD40 Red Box output and I would appreciate to have Hughes & Kettner reco fot them. Next, I would also like to connect Line Out of the GD40 on the Line 2 of the UR242 to have the sound before amplification, without the simulation introduced by Red Box. But my tests give int the monitor headphone a totally saturated and overwritten sound ??? Again, please any reco ? I spent a lot of time in various forums, either Steinberg oriented, either Hughes & Kettner oriented searching the valide combination of parameters but nothing found at that day. Thanks in advance for some solid material to progress on this. PS:help some instructions are in German here…. Been experimenting with a Micro Terror running in to the speaker in of the Red box Classic and I get clipping when I turn the volume on the amp. Is the u it defective or does it need a speaker load even though it’s solid state? Any help would be appreciated, thanks. Hi Guys. I have a pretty straight forward question and I hope you can help. I have a Tubemeister 5 and the matching (10″ i think) cab and as I am a night owl I want to be able to play through headphones occasionally. Can you give me an explanation of how to do this, do I need an external redbox or can I just run a XLR cable with a 1/2 adapter from the redbox out on the rear of the amp head? I also have a M-Audio M-Track here if that is going to be useful in this situation? Hi Alex! Hmm, you can’t directly connect headphones to the amp, so you’d either need a mixer, a headphone amp… or your M-Track 🙂 Just hook the Red Box up to the M-Track to connect the amp to your computer DAW, and use the computer’s headphones out. Now you’re set! I have a TM36 head, running into two 1×12’s. Can I use the redox output with a “Planet Waves XLR Female to 1/4 Inch Female Balanced Adapter” and then add a pair of headphones for silent practice? I would leave the speaker out attached of course, and set the watts to the “0” output setting. Will this work, so I can have a headphone out? Yes! That was it! Now I can crank my baby up as high as I want to and rock on at night! Thats so great, thank you guys again for the beautiful work you are doing for us, players! Yay, glad it was an easy fix! Now you can enjoy the full tube tone of your Meister whatever time of the day – or night – inspiration hits you 😉 Rock on! Hi guys! I’ve had this amp for a while and it is just awesome! Recently i bought an interface (Steinberg U22) because I need to play quiet now. The issue that I’m having is that I really cannot crank up the volume on lead channel (redbox DI -> Steinberg U22 -> MacBook with headphones plugged into the Steinberg stuff) since it is clipping on really low volumes (like 7:30 o’clock). Is there a workaround for this maybe? Otherwise this stuff is just insane, thanks for this beauty!!! Or am I only connecting the XLR output of the red box to my recorder and using the monitors to take the amp load, and not even using the thru output? Hi Randy. With the Red Box 5, you’re more limited than with the built-in ones on the Meister amps, and the best solution is going to be some kind of power attenuator. (Thinking about our first answer again, trying to find a solution using your studio monitors would also mean you having the master volume down, so that’s not going to work – the monitor speakers can’t help you turn the amp down.) A compromise to try is to have your master down, and set the Red Box 5 to Line Level. This way you’ll get a bit of the power amp tone at lower volumes, but it’s not going to be quite the same as the real thing. speaker out and do not use the THRU jack. would connect a tube amp head! Let us know if this works for you, or if you have any more questions! Thanks for ur answers. I ordered the Red Box 5. I ‘ll have it in a day or 2. My amp is an all tube Peavey 4X10 classic 50. I run it in clubs with both channels turned up (pre 8, post 12) normal, 12. The tubes don’t sing right until I have the master at just above quarter to, which is too loud at my condo, but I want that sound when I record. A friend who works at a guitar shop suggested the red box, but I’m wondering if I need a power attenuator. My recorder is a TASCAM 2488. I need to be clear about what you are suggesting to get my volume down without having to turn down the amp’s master volume. So first I connect the amp’s speaker out to the red box in. And I run a mic chord from the red box XLR out to a channel in the recorder. Now, are you then suggesting I don’t have to connect the other (thru) out to the amp speaker, but instead can connect to the recorder and use the monitor speakers to turn the amp volume down? If so, would I run the cord to a channel input? Also would it then be with an instrument cord instead of a speaker cord? Hi. I have a question about the Red Box 5. I want to record with my tube amp, but need to keep the volume down in my condo. Could I set my amp volume rather high like in a club and then reduce the volume at least somewhat with the red box? I know I have to keep the speaker connected. The idea being to get a good sound without being too loud in the room. Hi Randy. Are you using a standalone Red Box or one that’s integrated into one of our Meister amps? Because with our integrated Red Boxes, you don’t need to have a speaker connected, and of course you can also use the power soak too to get geat tube tones even at 1 watt (or silent, hence silent recording). If you’Re using the standalone Red Box (and if so, let us know what amp model you’re using) you’re right, you need a load box/speaker connected. The best way to get manageable volumes here would be to then hook the Red Box up to your mixer/DAW and use your studio monitors. The other way to reduce volume is to turn down your amp’s Master (if it has one!). We hope this helps a bit, but let us know if you have any more questions! I own a TubeMeister 36 Head, and I have a Red Box question. Is it possible to use the built in Red Box running into a mixer while at the same time using the speaker output the run into your cab for onstage monitoring? Damn I forgot I posted this. Is there a way that we can be notified via email when a reply hits? Great info thank you very much. I shall digest it all now!! I haven’t gotten any software yet so I’m wide open there. I have a grandmeister36. If i want to use the built in redbox for silent recording, what kind of device would i need to connect to a computer for recording. Also i had a go at plugging the GM directly into the house at my church and it was aweful sounding. empty and tinny. Through a mic’d cabinet its awesome. Is there something that has to happen in the sound room? thanks! Some people love the Red Box’s pure signal, but others find in some locations it can sound dry and, like you say, just a bit lacking in atmosphere or character. Churches are, of course, particularly difficult venues because of their natural acoustics! The best thing you could do here is add a little bit of echo or slapback delay to your sound, just to fatten it up – but just a minimla amount. Too much would be awfully mushy sounding Also, try fiddling the EQ slightly: cut the highs out a little, boost the mids slightly, and try and play as quietly as you can so everyone can still hear it! 😉 But a lot of this is dependent on exact venues too, so try and get a little time to soundcheck and experiment before you play next time. 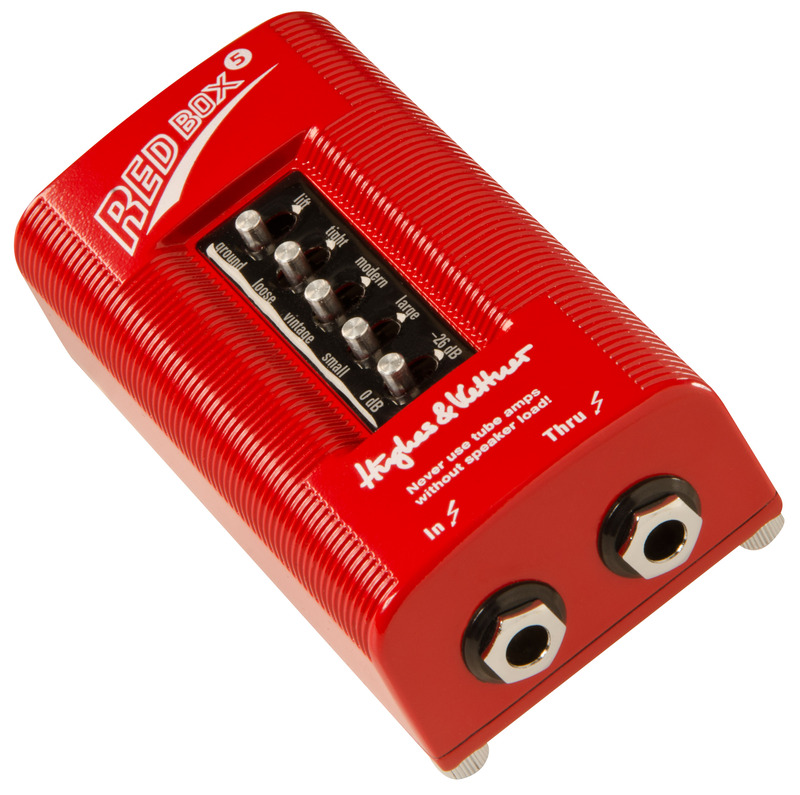 If you find the Red Box is not fat enough while recording, you can use an Impulse Response plugin (we have one available directly to download from the Red Box page on our site: http://hughes-and-kettner.com/products/redbox-5/). These impulse responses are real recorded wave-files of a micced cab in a room, so you’re getting a micced up speaker sound without having a to actually worry about the while mic setup/placement thing… The Impulse Responses work in the vast majority of DAWs, and can really liven up a dry tone. Hope this helps, but just let us know if you have any more questions! So I finally got the tubemeister 18 a week ago along with the 12″ speaker cab. I notice even on 1 watt, the volume is too loud and gets a fuzzy and muffled tone (with lead boost). If I turn the master up, the tone greatly improves. My question is, can I use the redbox to plug into a PA Speaker directly, and use the redbox’s attenuator to get the saturation of the tubes, but at a lower volume? Also, will keeping the amp on silent mode for extended periods of time damage the amp? Hi Lionel. The 1 watt setting might be too loud if you want to use the power tubes’ saturation. You can mute the speaker out and use the Red Box out, but you can’t use it drive a speaker directly, because the level and the impedance don’t match. You’d have to connect the Red Box out to an interface – a mixer or an active box – to do this. What kind of power supply works with the RB5? Boss PSA120S ok? If i did leave it in the speaker loop with a battery and no XLR plugged in, would it drain the battery? Or does the battery become active only when an XLR is plugged in? Hi again Jim. Anything in bewteen 9-24 Volt AC or DC will work as a power supply. The battery is activated as soon you use the jacks (the XLR won’t make a difference). This means that if you keep it in the loop, a battery is not the best solution, because it’ll get drained… Hope this helps! 1) Is the thru signal passive- could you just leave it connected in a combo amp without battery/power supply and then plug it in when using the DI out? 2) If a battery is left in, does it activate from the DI or from the input or thru jack? If it sees phantom power, does the battery deactivate? Looking to permanently mount the RB5 in my combo, but don’t want to burn batteries or always have a power supply plugged in if not running the DI out. Hi Jim. This’ll work: you won’t need a battery, just leave the Red Box in the speaker loop! i have a question: do you think i can use my tubemeister 18 combo’s red box out into a guitar headphone amp (like EHX or MXR)? Or would the line level signal be too high for those to handle? Hi Marcel – yes, a headphone amp like that should be just fine! TY, It is now 10:30 and the kids are in bed. I want to play and even 1 watt on my grandmiester will wake my kids. They are right below where my amp is 1 floor down 🙁 I would like a way to tinker with my new toy and jam late night & the redbox modification may be a decent option if it can work. Ty for letting me know the possibility. Cheers !! Can the redbox be used as a headphone converter? Can you run silent mode into a headphone to practice? Hi Rob. 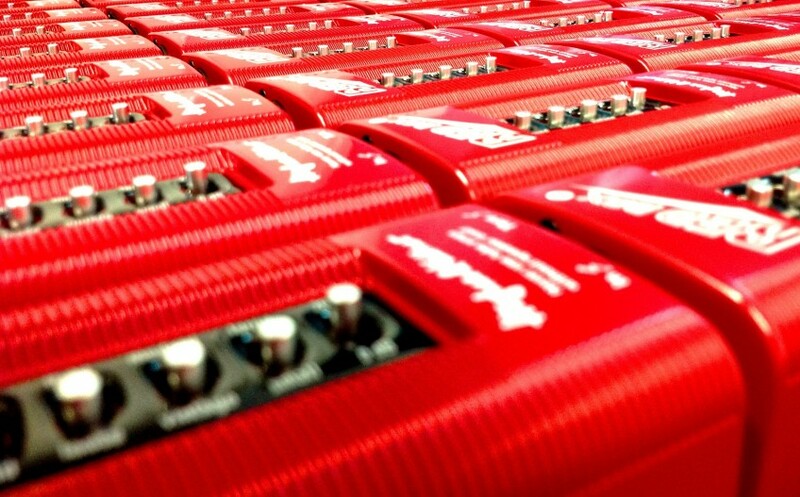 The built-in Red Boxs you find on the Meister Series could be, as they have line level. We also know that some users have made a mono XLR to stereo mini jack adapter for this purpose, but it’s not perfect because the master volume determines the level. So, in short – it’s not really built for it, but there’s ways to do it if that’s what you want 😉 Hope that helps! I have a Grandmeister and was wondering if one could use the Red Box contained within the GM with another amp? I have no reason to do this, but was just wondering if one could? Thanks. Hope that helps, and all the best!